What comes around, goes around. While local farmers deal with their own cashflow issues, in the next few days, on the other side of the world, the United Kingdom’s National Farmers Union is organising a march through London to raise awareness of the gap between the cost of production and farm gate prices. I was in London 14 years ago as part of a New Zealand farming roadshow when a similar march took place. A colleague and I joined some 160,000 people marching to Downing Street. It was a huge event and a memorable occasion.Now another London rally has more of the same: farmers facing the same problems, and the same lack of recognition for the economic vagaries of producing food.Meanwhile, in Australia, at around the same time, a mediation service was established to assist bank-stressed clients. This was politically instigated following 2002’s disastrous drought, when banks were foreclosing farmers and grim stories were appearing in the rural press. I was in Australia regularly and saw this. In the past few days, that service reported a 96 per cent success rate over its 10 years of existence, an excellent outcome for both banks and farmers. Now the federal government is preparing to compulsorily introduce a mediation service in all states and territories. Food for thought on whether something similar might benefit New Zealand.In our present challenging times, these recollections remind me that, by working together, the farming community can look after itself. PGG Wrightson understands what farmers are facing. We are committed to standing alongside our farming clients and doing whatever we can to provide support.While the term ‘farmers are resilient’ can ring hollow, our industry does keep creating positive stories. 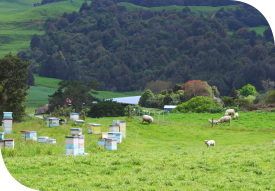 For instance, my colleagues and I have taken calls in recent weeks from purchasers looking for property with potential for manuka honey production, a new business opportunity that could add considerable value to blocks with otherwise limited economic appeal.In dairying, although enquiry for properties has diminished, a pool of motivated buyers remains, with money they are prepared to invest. When the right farm is offered for sale, in a desirable location and with good infrastructure, it will find a buyer.